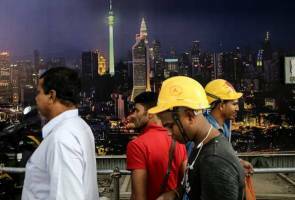 The total remittance volume sent home by foreign workers from Malaysia increased 23.2 percent to RM34.75 billion in 2015 from RM28.21 billion in 2014, the Dewan Rakyat was told today. Deputy Finance Minister Datuk Johari Abdul Ghani said Indonesia was the top recipient of remittances from 2011 to 2015, followed by Bangladesh, Nepal, India and the Philippines. The remittances grew from 17.1 percent in 2011 to 23.2 percent in 2015, he said when responding to a question from Nga Kor Ming (DAP-Taiping). The total remittance volume jumped to RM28.21 billion in 2014 from RM22.7 billion (2013), RM18.4 billion (2012), and RM15.7 billion (2011). As for last year, RM6.2 billion was remitted to Indonesia followed by RM4.6 billion (Bangladesh), RM3.6 billion (Nepal), RM2 billion (India) and RM1.1 billion (the Philippines).